AFC Stanground manager Rob Ames is confident his side can spring a semi-final shock tomorrow (February 27). Stanground host Pinchbeck United at Yaxley FC with a place in the Peterborough League’s President’s Shield Final at stake. The city side are 21 points and nine places below their visitors in the Premier Division table, but Ames believes the omens are good for his underdogs. Ames said: “We were very unlucky to lose on penalties to Pinchbeck in the PFA Senior Cup earlier this season. “They are a very good side, but we matched them that day and that performance will give us the confidence to go one better this weekend. “It’s massive for us to be at home. We’ve only lost a couple of times on the 3G pitch at Yaxley. We’ve turned it into a bit of a fortress. 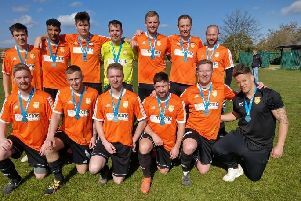 Stanground warmed up for their big day with an 11-0 Premier Division thumping of city rivals Riverside last weekend, a game Amos missed as he was at a wedding, before rushing home to help deliver his third child! Martyn Fox scored four of the goals. The second President’s Shield semi-final sees two top Premier Division sides go head-to-head as unbeaten leaders Moulton Harrox host in-form Netherton United. Both enjoyed big league wins last weekend with Moulton crushing Sawtry 9-0 and Netherton bashing Holbeach Reserves 7-0. Whittlesey Athletic will expect to take advantage of Moulton’s cup commitments by joining them on 52 points by winning at Thorney in a league game tomorrow. Moulton will have two games in hand though.